Social Security beneficiaries are slated to receive a 2.0% cost-of-living increase in benefits in 2018. The raise is calculated based on inflation, and the increase is a result of an uptick in the Consumer Price Index in 2017. In addition, the CPI move affects other Social security calculations including tax-exempt earning levels. Today, more than 38 million Americans receive benefits. The 2018 COLA is the highest amount in six years. At the same time, many seniors are facing an increase in Medicare Part B premiums this year. Changes in taxable income and earning levels were released by the SSA in January. 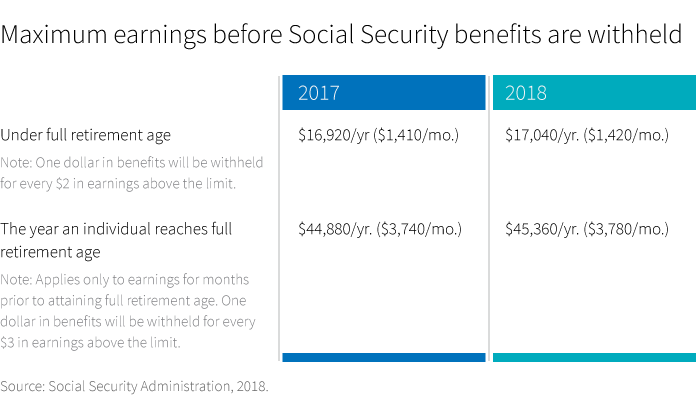 Social Security also announced an increase to the limits on the amount that beneficiaries may earn, and retain their benefits, during the period prior to full retirement age and once reaching full retirement age. In December, House Speaker Paul Ryan indicated that Republicans would likely focus on entitlement spending including Medicare and welfare in 2018 as way to rein in the nation’s deficit. In the current political environment, policy changes to Social Security remain unlikely as any reform would require bipartisan support. Changes to Social Security cannot be moved through the reconciliation process that could approve legislation with a simple majority in the Senate. Still, Social Security is expected to run out of reserves by the early 2030s.